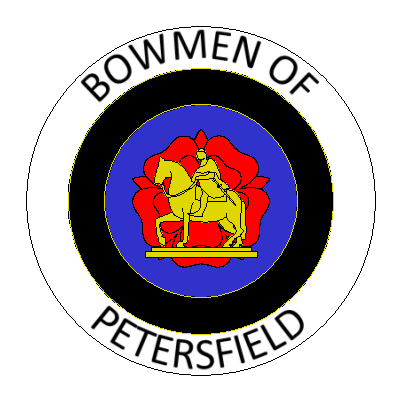 Bowmen of Petersfield are a target archery club shooting at The Petersfield School, Petersfield in Hampshire. We shoot during the summer months on the school field by the tennis courts on Tuesday and Friday evenings 6pm - 8pm (or dusk if earlier), and Sunday mornings 9.30am - 12.30pm. In the winter months, we shoot in the sports hall on Tuesday evenings 7pm - 9pm, and Sunday mornings 10am - 12noon. The club was formed in April 1986, with three fully affiliated members and seven associate members who were members of The Forest of Bere Bowmen and who gave us their support to help the club get off the ground. We held our first club session on the East Hants District Council ground at Penns Place sharing the field with the cricket club (who had priority). The only storage we were allowed was a corner of the cricket pavilion, so it was not very satisfactory. Our Indoor venue was in the Taro Centre, on a Friday evening from 9.00 to 11.00pm, which was much too late for our junior members and also too late for a drink afterwards! A few years later Petersfield Town Football Club offered us the use of their football ground. Again the footballers had priority but we could shoot there two evenings and on Sunday mornings. Our next move was to our current home at The Petersfield School. We use the sports field for outdoor shooting in the summer and the Sports Hall for indoor shooting during the winter months. We have a good working relationship with the school, offering the PE department archery sessions for year 11 pupils and recently getting involved with the GCSE programme. The club has also been involved with helping youngsters achieve Gold, Silver and Bronze awards in the Duke of Edinburgh Awards scheme. We are a friendly club and welcome all who are interested in trying archery. We have a number of experienced coaches who are always willing to help members improve their shooting. On the shooting field you can compete against others or just do your own thing, there is room for all comers and all abilities.